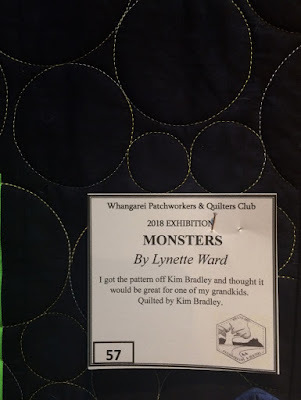 I mentioned in my last post that I visited Whangarei Quilters Exhibition. 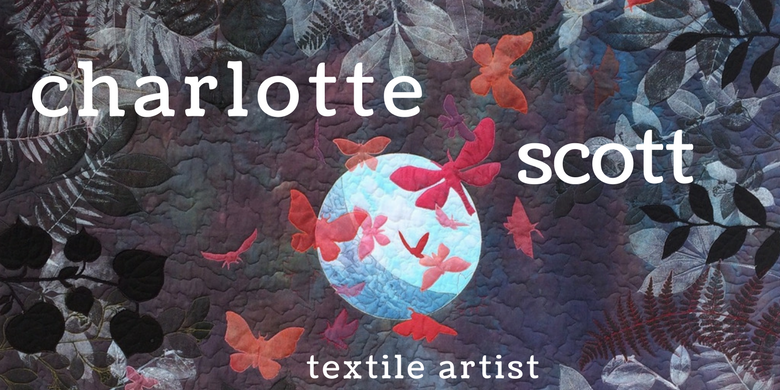 This is a biennial exhibition held in April and is always worth the hours' drive for me. 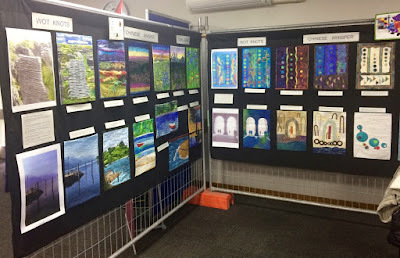 They allow photography, so for those of you who couldn't make it, I'm sharing some so you can get an impression of what was hanging. One of my favourite corners was the Wot Knots Chinese Whisper Challenge. 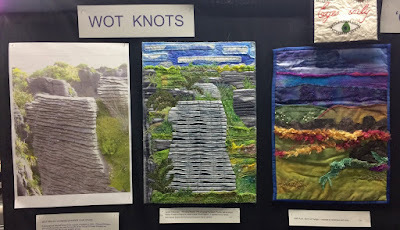 The Wot Knots are a stitching group focused on challenging themselves and leaning much more towards the art rather than the traditional. In the Chinese Whisper Challenge, members were divided into groups. 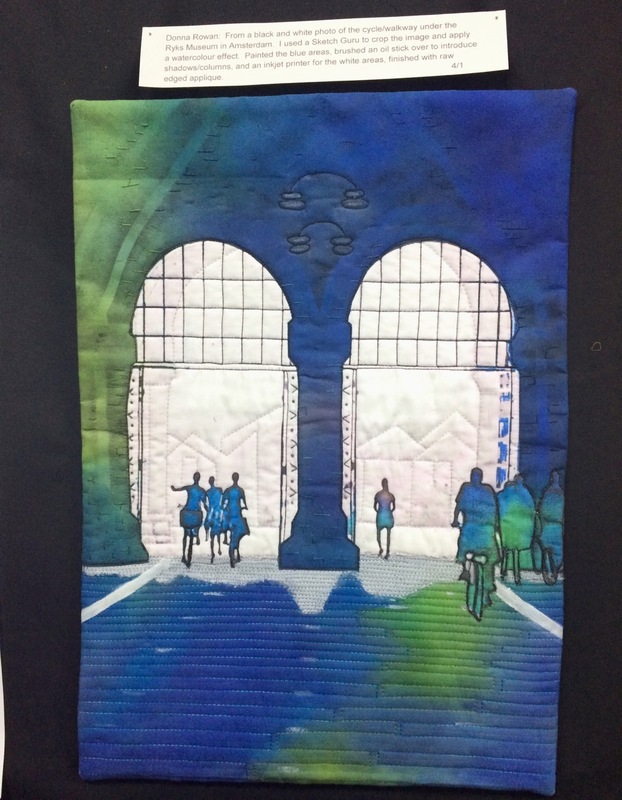 The first person in the group made an A3 quilt from a photograph. 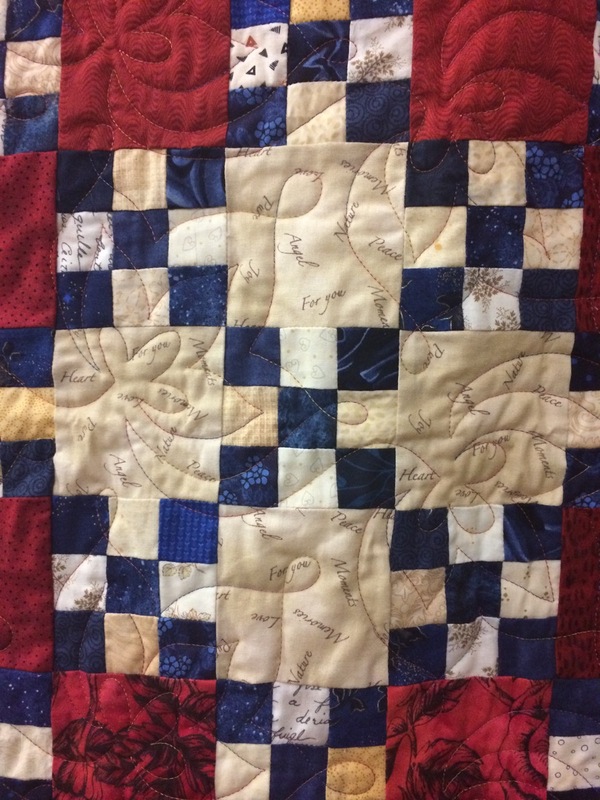 The second person got to see the first persons quilt (not the photograph) for 15 minutes, no discussion allowed, then had to make their quilt from what inspired them during that viewing. The next two photos are one groups successive quilts from a photo of pancake rocks through to abstract agapanthus flowers! L-R photographic inspiration, Lynne O'Donnell, Kath Hunt. It's a great idea for a challenge, and this particular group managed it very well. 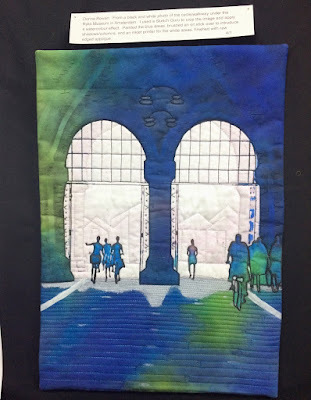 I think the quilts were a good size and the two months between each group member allowed for thoughtful, skillfully done quilts. 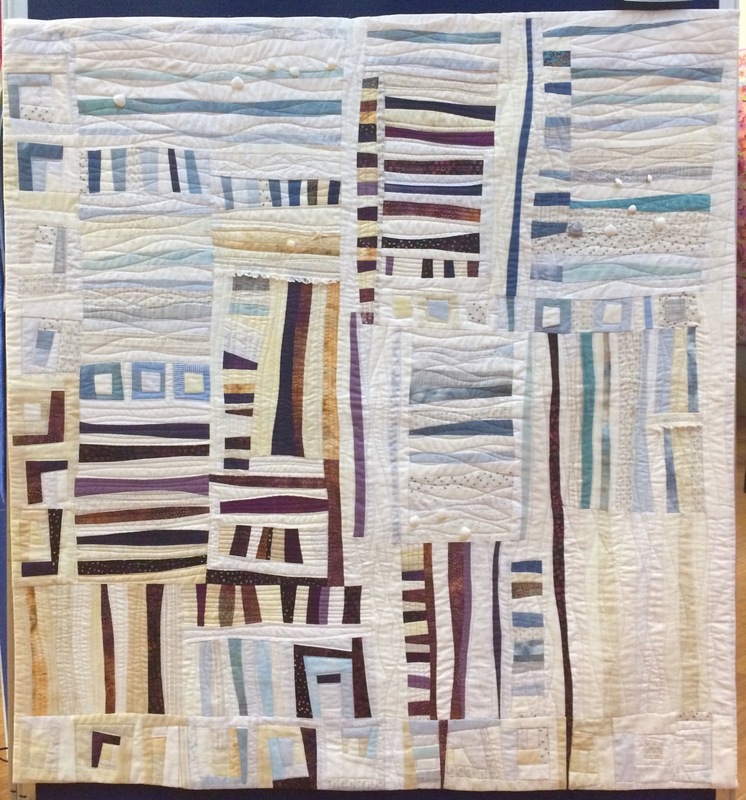 The quilt above is by Donna Rowan and is the first quilt from group number 4. One of my favourites from the whole exhibition. The light is beautiful and the small details to suggest features, such as some single hand embroidery stitches to give the impression of bricks, is a masterful touch. 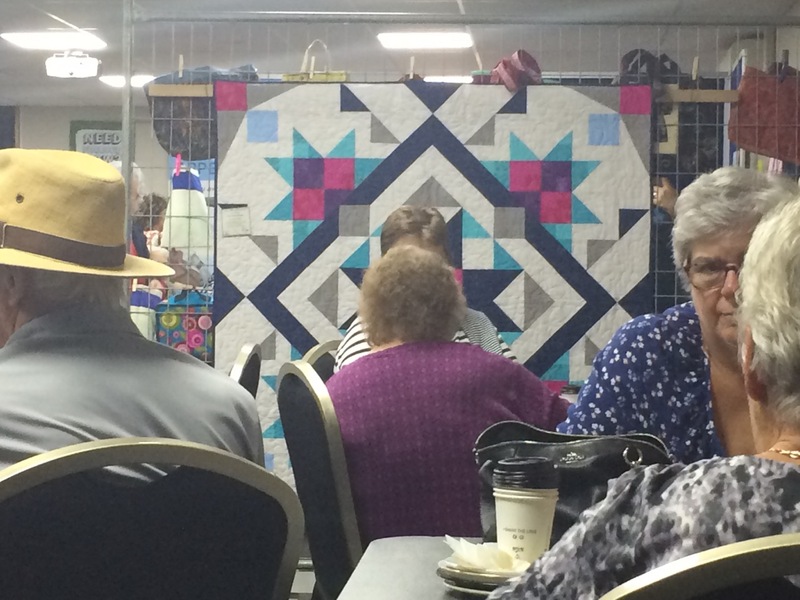 Moving on into the main hall with the large quilts, the merchants and the sales table. 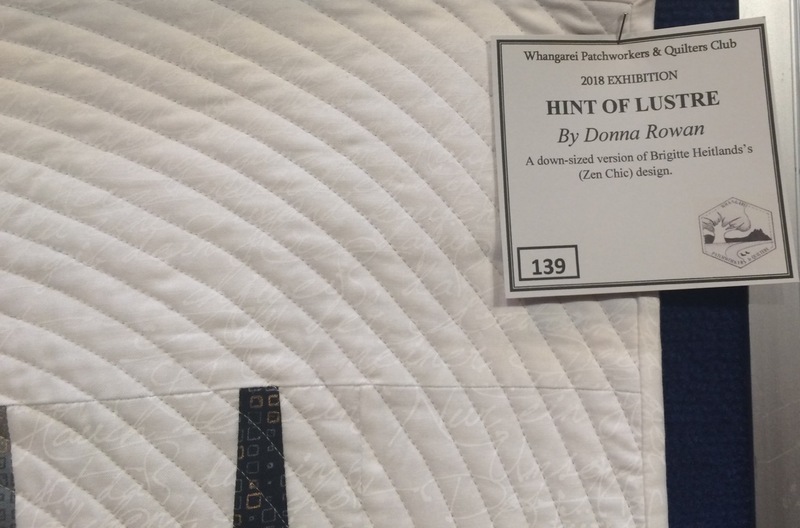 I was interested to note that scarcity of what could be classed as 'modern' quilts. 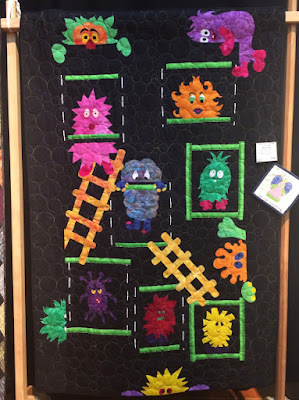 I'm not sure why this is, whether the members aren't making modern quilts, or that there just weren't many on display. 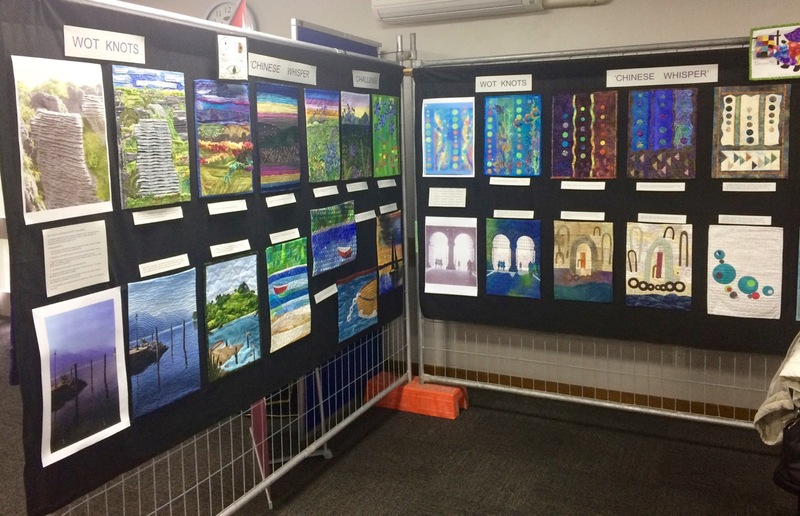 But either way, the majority of quilts were traditionally pieced or appliquéd, with some lovely art quilts mixed through too. 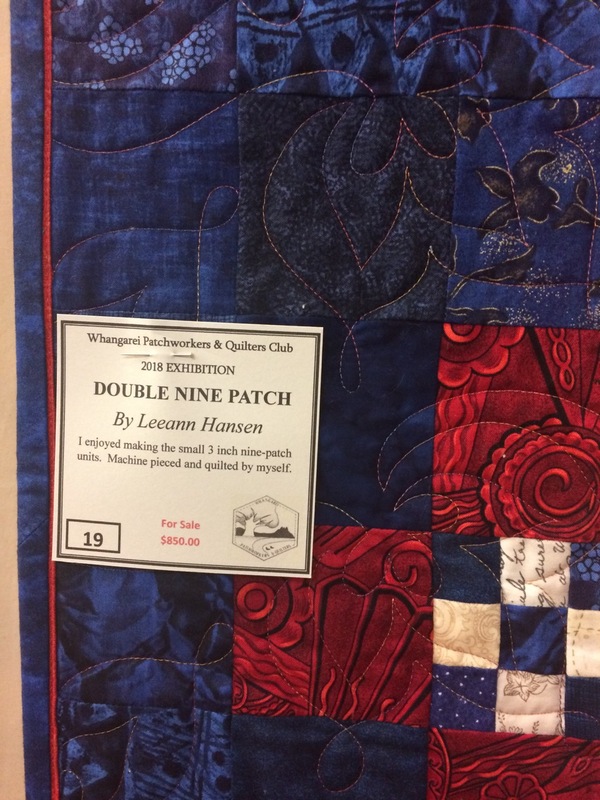 This was a very large quilt made my Leeann Hansen. 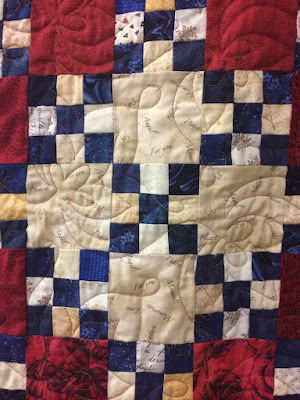 The small five-patch squares were 1 inch finished, so plenty of skill to keep the quilt straight and square with all those tiny seams. 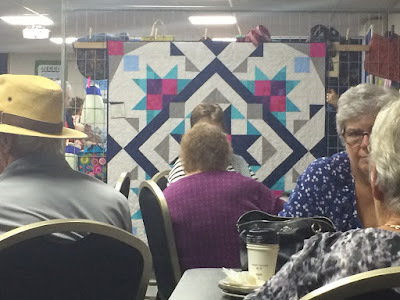 Having the border as almost an extension of the quilt piecing heightens the 'interest' factor. There was the nice detail of a red flange in the binding, which set off the red diagonal chains beautifully. Leeann completed the quilting herself with a complementary all-over pattern. There were some really nice baby quilts. 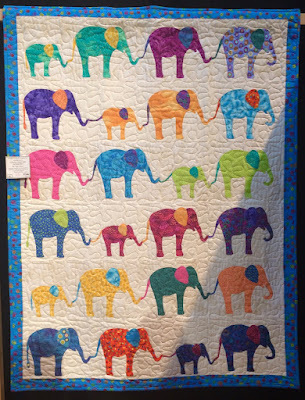 The one above was made by Lynette Ward and quilted by Kim Bradley. See the monster peeking up from the bottom edge? A fun quilt that's a bit different. And the circle quilting complemented it nicely. Sorry about the shadow in the photo, the lighting wasn't the best in the hall, but I guess you work with what you've got! 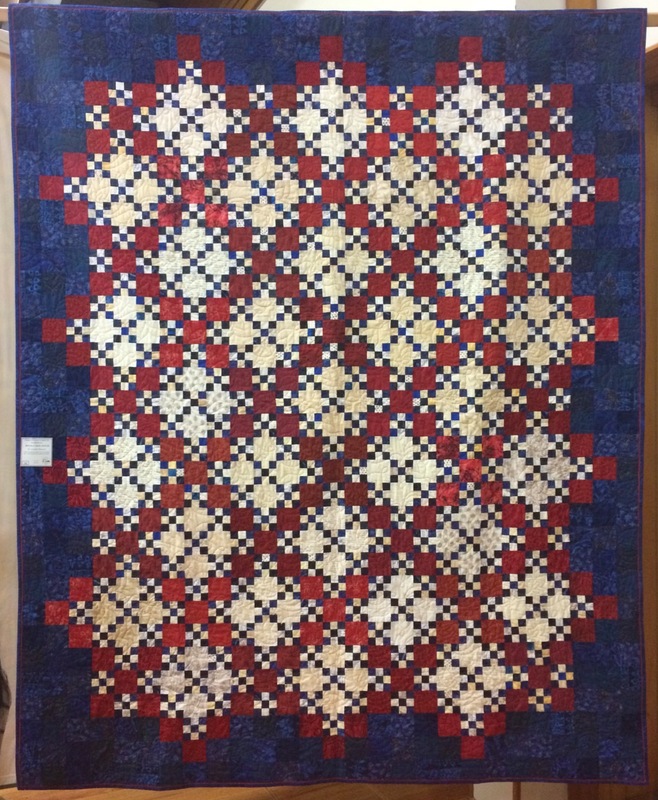 This quilt was made by Jane Taylor, adapted from a Quiltmania pattern and quilted by Ed Reid. It was an eye-catching quilt, beautiful workmanship and I loved the addition of the baby elephants. 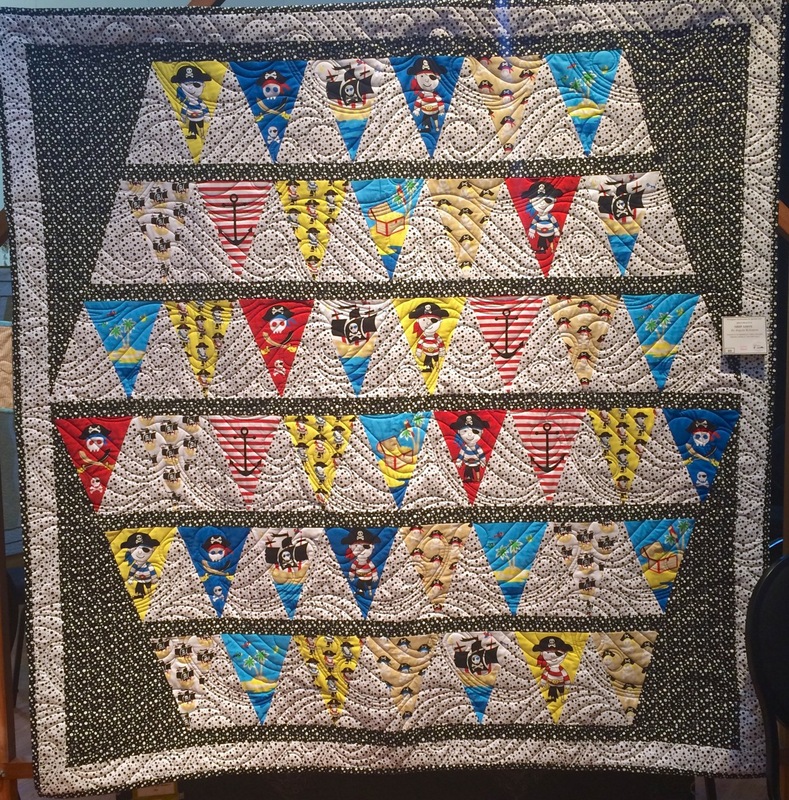 And less of a baby quilt, more of a kids quilt, Ship Ahoy made by Angela Robinson and quilted by The Quilt Fairy's. The bunting shapes reminded me of ship's flags and made really good use of the pirate themed fabrics, while the dynamic quilting design brought to mind ocean waves. From the few modern quilts that were included, here are two that stood out for me. 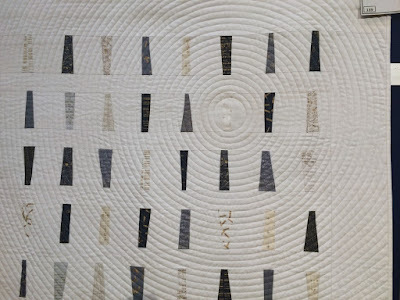 Due to shadows and lights, I'm only sharing a detail of 'Hint of Lustre' by Donna Rowan, a version of a pattern by Brigette Heitland of Zen Chic. 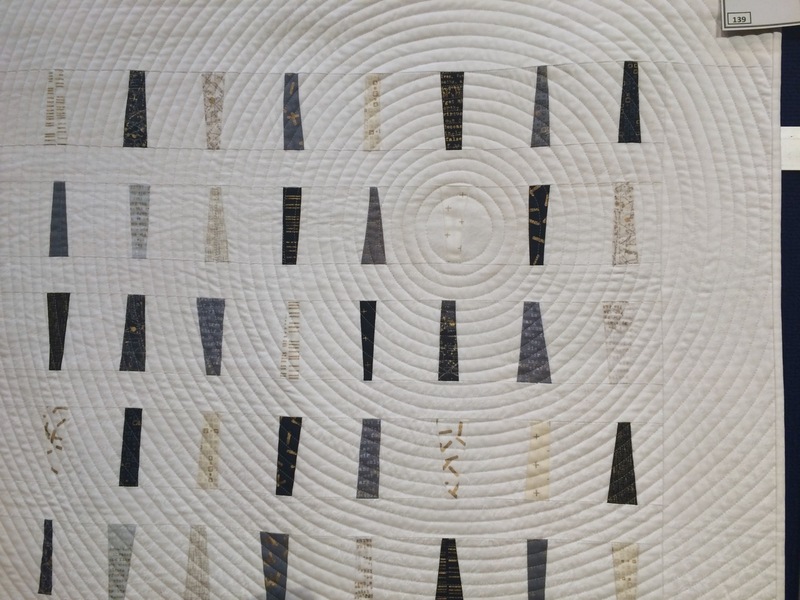 The patterned fabric brought movement to the very minimalistic piecing and the circular quilting added lots of interest in a contrasting way. 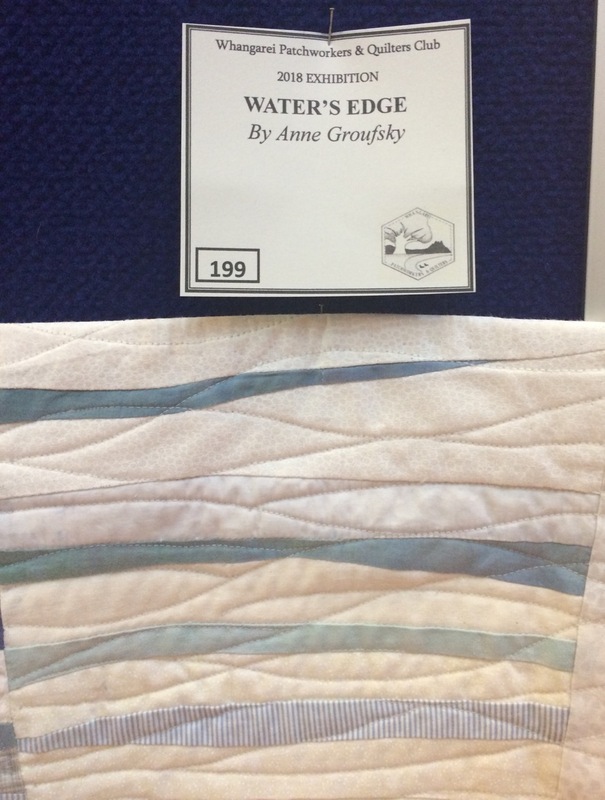 Water's Edge by Anne Groufsky showed that Anne is a master of improv piecing. 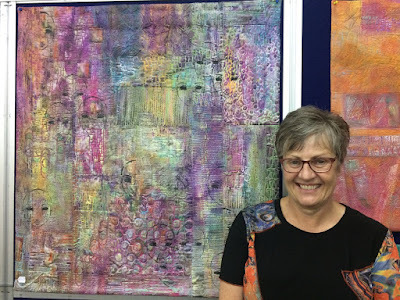 She pulls the random piecing together with repetition of various shapes and blocks and worked in a controlled colour palette to help give cohesiveness to the work. There was a very popular cafe being run by the quilters and my friend and I had some soup, a slice and a hot drink, with a much needed rest for our feet. 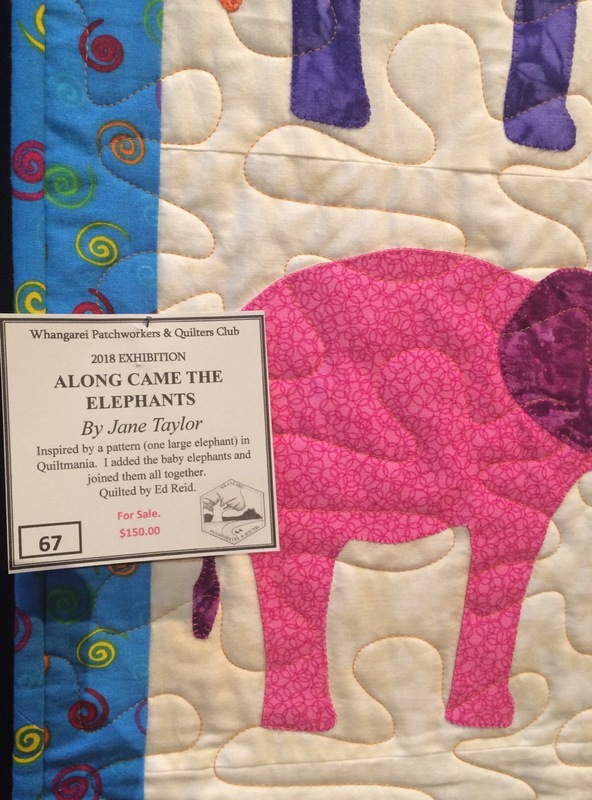 Whilst enjoying my repast, a very familiar quilt caught my eye! Sure enough, when I went to have a closer look, this was Jane Taylor's version of the Pacific Stars Mystery Quilt that I wrote for Carol's Quilts last year. Nice to see one in the wild! You can still find all the instructions for it here if you'd like to make your own version. Petra Pilkington was the guest exhibitor with her beautiful abstract, heavily layered work. Petra usually works by quilting first and then layering paint on afterwards and you can see the luscious texture this gives in the second photo. Yummy! 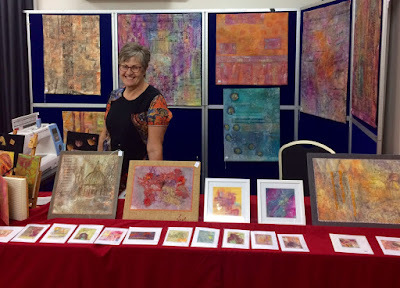 There were many more quilts to see, and merchants to visit, and a sales table to peruse. I hope you enjoyed this glimpse and maybe it's a show you'll add to your calendar for 2020. I loved the Chinese Whispers challenge too! 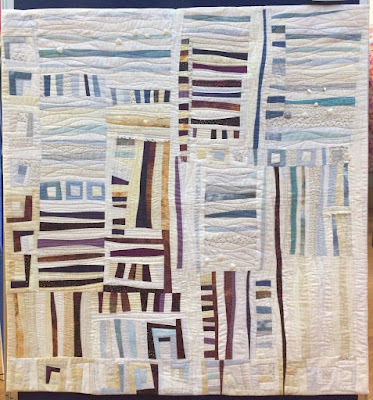 Thanks for including my quilt in your post. I'm glad you liked it. I enjoyed making all the small units with one inch squares...crazy I know! 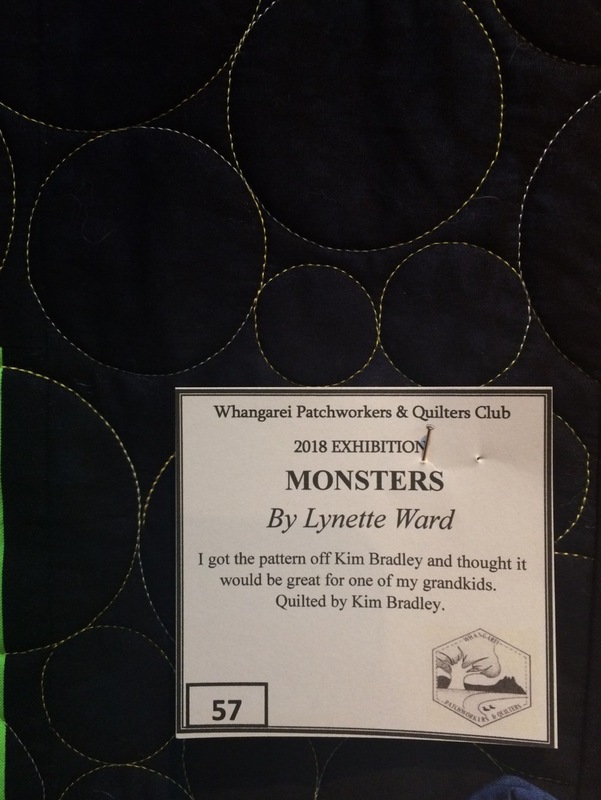 Interesting to see which quilts caught your eye... I thought it was a well balanced exhibition, with a bit of everything.